A Fayetteville Dentist Says To Chew Gum For Concentration! Do you feel sleepy and unable to concentrate every day after lunch? Or maybe you’re a night owl and like to work late into the evening hours? If so, you probably reach for caffeine to help improve your focus when your body and mind are telling you it’s time for a nap. As it turns out, a recent study published in the British Journal of Psychology found evidence that chewing sugar-free gum for 30 minutes improves concentration and memory. If you’d like to know more about this simple solution for waking up your brain, as well as how it can prevent cavities, a Fayetteville dentist discusses how it works. Are Concentration and Chewing Gum Really Linked? In the study mentioned above, 38 participants were given a memory test. Some of them were given sugar-free gum and told to chew on it throughout the test. The others took the same test without gum. Initially, the group that didn’t chew gum performed better, but in the later stages of the test, the group that did chew gum excelled. The researchers concluded that chewing gum is ideal for tasks that require extended focus over a longer period of time. Who could have guessed that gum is such an easy and inexpensive option for getting through your day with an improved ability to concentrate? As it turns out, there are additional benefits for your oral health as well. What Are the Other Benefits of Chewing Sugar-free Gum? 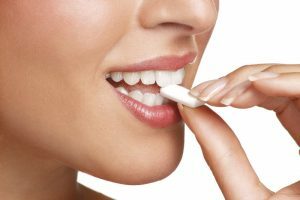 As long as you choose sugar-free gum, preferably one that has the American Dental Association (ADA) seal of approval, you’ll be benefitting yourself in more ways than one. Several studies have shown that chewing sugar-free gum actually prevents cavities. It’s safe to say that everyone would rather prevent decay in the first place than get dental work after a cavity has formed! How does it work? Very simply, chewing gum stimulates salivary flow. Saliva does several things to prevent decay: it washes away plaque, bacteria and food debris and reduces acid in the mouth, which can dissolve enamel. Saliva also contains minerals, including calcium and phosphate, which can strengthen enamel and counteract the effect of acids in the mouth even further. Gum is particularly helpful right after a meal. To get the most benefit, chew it for a full 20 minutes after meals. Remember that while this is an easy way to improve your oral health, it’s only an adjunct to brushing and flossing, which is an important piece of any good oral hygiene regimen. The other piece is regular checkups and cleanings with a dentist in Fayetteville. These visits are a great opportunity to have a thorough assessment and consult with a professional about all of your oral health needs. Dr. Angela C. Ruff is a long-term resident of Fayetteville and is dedicated to providing high-quality, compassionate dental care to her community. With over 25 years of experience and a commitment to continuing education in the latest techniques, she combines the best of both to bring you an outstanding dental experience. She can be contacted via her website or at (910) 630-6199. Comments Off on A Fayetteville Dentist Says To Chew Gum For Concentration!